The Hierarchical Token Bucket Quality of Service (HTB QoS) system is a great tool to use for controlling the bandwidth of a network link, especially when you have a bunch of doggs on your network that love to use up all the internets they can get! Lets take a look at a quick and simple HTB QoS setup on a CentOS 6 Linux box. Next, make sure that you have the iproute package installed, to install the necessary prerequisite programs. Now, one other set of commands I want to run, to slightly change the names of the htb files to fit my needs. I am only going to have two classes of traffic, plus the default. I want to make sure my www and ssh connections each have a separate allocated bucket of bandwidth, and everything else can share the default bucket. The commands below will rename the htb configuration files to match. Please note that we are using the eth0 device in this example, since it is our internet connection. Ok! Now that we have the init script in place, and the rules files in place, we can actually start some bandwidth shaping! Notice here that we are setting the rates at 20Mbit, which is below our maximum tested rate of 23Mbit. By setting our rate lower than the actual link rate, we limit the buffering done by any network equipment beyond our router (like the cable/DSL modem). This will decrease our lag time by keeping any traffic buffers on our faster equipment. I will gladly sacrifice a small amount of total speed for lower latency. 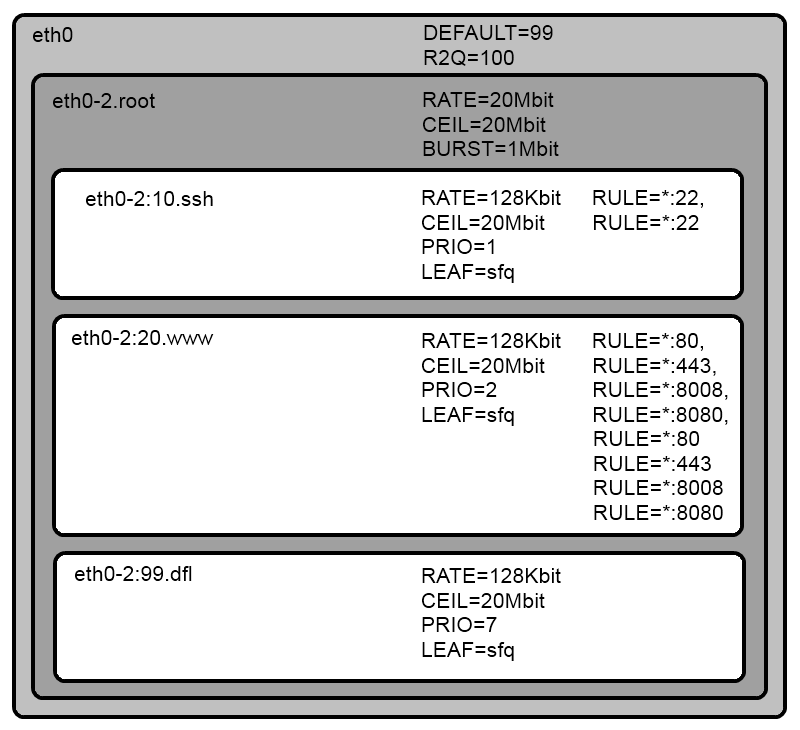 Now, lets take a look at the RULE= lines from the eth0-2:10.ssh file above. Rules are specified with the pattern RULE=[[saddr[/prefix]][:port[/mask]],][daddr[/prefix]][:port[/mask]], so the first line, RULE=*:22, will match all traffic with a source port of 22. The second line, RULE=*:22 matches any traffic with a destination of port 22. We do the same thing with the appropriate port numbers for our www class in order to shape our www traffic. There are many options here, since this is where we control what traffic matches which class; you can specify traffic by source port, destination port, source IP, destination IP, or a combination of them! Take a look at the links below for some more examples. Finally, the default rule will apply to any traffic which does not match our first two rules. The image below illustrates the hierarchy within this specific setup. Using this simple HTB QoS setup, we can provide network bandwidth control to our small home network, preventing any one dogg from hogging all the internets! This setup will also scale fairly well to much larger installations. Take a look at the htb.init-v0.8.5 we downloaded earlier for some more rule examples, as well as explainations of the configuration options. Also check out the following websites for some more information on HTB QoS network traffic control. Give it a try and let me know! I hope it works for you. Could it possible to control bandwidth for a specific address? Yes, just replace the asterisks in the rules with the specific address! Pls suggest if I’m wrong. This makes me think the RULE=*:22, would apply to traffic going from port 22, and RULE=*:80 would apply to traffic going to port 22. Hopefully this is correct, but if you find that I am incorrect, please let me know. This server has received 1322021 hits from both ipv4 and ipv6.